Showing results for tags 'age estimation'. These are the pubic bones of a 59yo female (ABD_LYMPH_006) from the CT Lymph Nodes Collection of TCIA, which is made available under Creative Commons Attribution 3.0 Unported License. I modeled these with the Grayscale Model Maker in 3D Slicer (see tutorial pt. 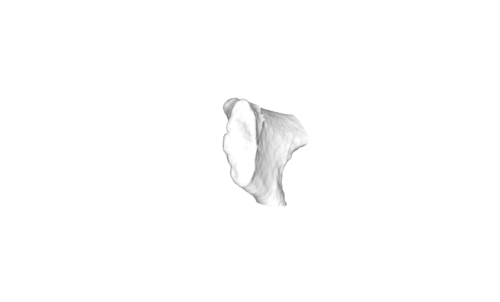 1), hollowed with Meshlab, fixed for printing with Meshmixer. "ABD006_PS_F59_1mm.stl" has a wall thickness of 1 mm to minimize material volume for printing with powder-based printers (for example, through Shapeways)--I would recommend white "strong and flexible plastic." "ABD006_PS_F59_hollow.stl" is hollow with filled holes--this is what I would use for filament printers, but you could use this to print a solid model through Shapeways. I also cut the bottoms flat on both so they can be oriented upright to print--I would not recommend printing with the symphyseal face up because the layering process will impose ridges. If you want to split the left and right halves, in Meshlab use the filter "Split in Connected Components"--once split, each "layer" can be exported as separate .stl files. The "Plane Cut" tool in Meshmixer can be used to further cut the models if you want smaller segments. 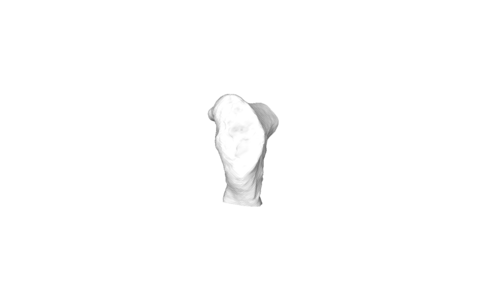 If you would like to add shading to the 3D models to enhance viewing of the symphyseal face, in Meshlab apply the Filter--> Color Creation and Processing--> Ambient Occlusion per Vertex. These are the pubic bones of a 41yo female (ABD_LYMPH_005) from the CT Lymph Nodes Collection of TCIA, which is made available under Creative Commons Attribution 3.0 Unported License. I modeled these with the Grayscale Model Maker in 3D Slicer (see tutorial pt. 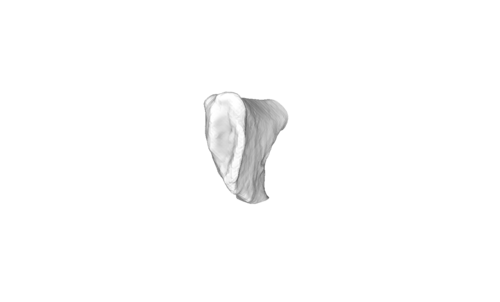 1), hollowed with Meshlab, fixed for printing with Meshmixer. "ABD005_PS_F41_1mm.stl" has a wall thickness of 1 mm to minimize material volume for printing with powder-based printers (for example, through Shapeways)--I would recommend white "strong and flexible plastic." "ABD005_PS_F41_hollow.stl" is hollow with filled holes--this is what I would use for filament printers, but you could use this to print a solid model through Shapeways. I also cut the bottoms flat on both so they can be oriented upright to print--I would not recommend printing with the symphyseal face up because the layering process will impose ridges. If you want to split the left and right halves, in Meshlab use the filter "Split in Connected Components"--once split, each "layer" can be exported as separate .stl files. The "Plane Cut" tool in Meshmixer can be used to further cut the models if you want smaller segments. 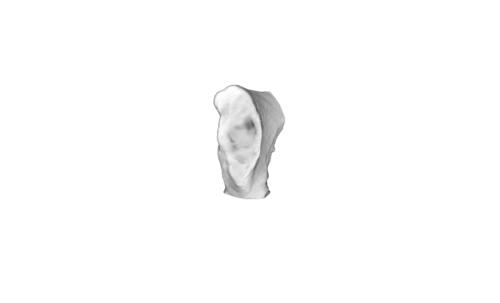 If you would like to add shading to the 3D models to enhance viewing of the symphyseal face, in Meshlab apply the Filter--> Color Creation and Processing--> Ambient Occlusion per Vertex. These are the pubic bones of a 60yo male (ABD_LYMPH_004) from the CT Lymph Nodes Collection of TCIA, which is made available under Creative Commons Attribution 3.0 Unported License. I modeled these with the Grayscale Model Maker in 3D Slicer (see tutorial pt. 1), hollowed with Meshlab, fixed for printing with Meshmixer. "ABD004_PS_M60_LR_1mm_cut.stl" has a wall thickness of 1 mm to minimize material volume for printing with powder-based printers (for example, through Shapeways)--I would recommend white "strong and flexible plastic." "ABD_004_PS_M60_flat2.stl" is hollow with filled holes--this is what I would use for filament printers, but you could use this to print a solid model through Shapeways. I also cut the bottoms flat on both so they can be oriented upright to print--I would not recommend printing with the symphyseal face up because the layering process will impose ridges. I've included a screenshot showing how to split the left and right halves in Meshlab using the filter "Split in Connected Components"--once split, each "layer" can be exported as separate .stl files. The "Plane Cut" tool in Meshmixer can be used to further cut the models if you want smaller segments. 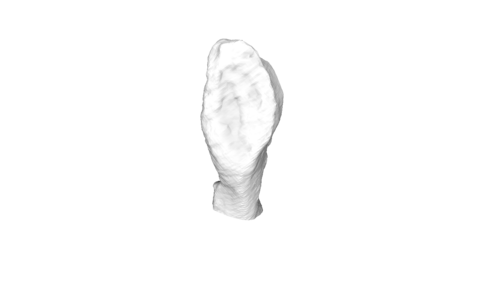 If you would like to add shading to the 3D models to enhance viewing of the symphyseal face, in Meshlab apply the Filter--> Color Creation and Processing--> Ambient Occlusion per Vertex.